Having naturally curly hair, alternately the bane and joy of my existence, the title of this stylish bag caught my eye. 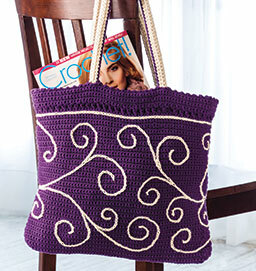 It’s a free crochet pattern from Italian designer Nicoletta Tronci, featuring lots of single crochet to make the fabric sturdy, and some whimsical topstitching to fancy it up. It would probably look great in any color, but I really like the purple. This is a fairly complicated pattern, but the results are worth the patience and effort. If you run into problems, see the comments below, which contain suggestions.